Buster Crabbe as Flash Gordon Conquers the Universe. The whole complete series in this amazing 3 dvd box set. Delivered FREE in the UK with super saver delivery. PLEASE NOTE THIS IS A LOSS LEADER ONLY ONE PER CUSTOMER. Can our hero, Flash Gordon, saviour of the universe, save the Earth from the dastardly master plane of Ming the Merciless, to control the galaxy?. 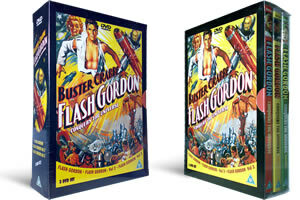 This Flash Gordon series was made in the 1940's and was a twelve episode serial film about Flash and his adventures. This series was shown on television in the 1950's and was just before science fiction became huge with Star Wars and other super hits. Titles include: The Purple Death, Freezing Torture, Walking Bombs, The Destroying Ray, The Palace of Terror, Falming Death, The Land of the Dead, The Fiery Abyss, The Pool of Peril, The Death Mist, Stark Treachery, Doom of the Dictator. Eligable for Free Uk Super Saver Delivery. Lots of happy memories of Saturday morning pictures, and so cheap, the start of all sci fi. Wonderful memories of those Saturday afternoon cinema shows. Great to relive those days with Larry Crabbe and Charles Middleton. Beautiful nostalgia at a ridiculously cheap price. Exactly what I expected from a sci fi from this period. It's so bad it is very good. It is possible to see how all the great sci fi films developed from this.